South African surfing sensation Jordy Smith clinched his second consecutive Billabong Pro J-Bay title when he beat Australian Mick Fanning in a tense final held in testing 1.5 metre waves and strong onshore winds at Supertubes in Jeffreys Bay today. Smith, who looked in championship winning form ever since posting the highest scores of Round 1 last Friday, made full use of his many years of experience at Jeffreys Bay to tame the ‘victory at sea’ conditions and employed his exciting arsenal of progressive and aerial manoeuvres to rack up rides of 8.60 and 7.0 for a heat-winning total of 15.60 out of 20 in the final. Smith also collected the Nixon WTA award of a custom built Nixon watch valued at $10 000 for scoring the highest heat total at the event of 18.30 out of 20 in his Round 5 win over Bede Durbidge (AUS). Fanning, a former two-time World and J-Bay champion, led the final with an excellent 8.0 point ride early on and was briefly out in front again at the halfway point, but could not produce the 7.61 point ride he needed to overtake Smith once the South African had snatched the lead back with an innovative ‘double-grab’ aerial with 12 minutes remaining. The Australian, who takes home $30 000 and 8 000 points that sees him leapfrog from No. 8 to No. 4 on the rankings, was full of praise for Smith in his runners-up speech, before showering the winner with champagne. He also echoed the feelings of all of the world’s best surfers when he wished the late Andy Irons, a former three-time ASP World Champion, a happy birthday and sent his greetings to Irons’ family in Hawaii. Smith started the final day in rampant form, powering his way to convincing victories over experienced former double J-Bay runner-up Damien Hobgood (USA) in the quarterfinals and then leaving Adrian Buchan (AUS) needing to replace both his scores to come within striking distance of winning their semi-final match-up. Fanning meanwhile combo’d compatriot Josh Kerr in their quarterfinal encounter before coming out on top in a titanic semifinal battle with close friend and fellow Aussie Joel Parkinson where Fanning snatched victory with an incredible near-perfect 9.80 point ride, the highest scoring ride on the final day of competition. With his equal third place finish here Parkinson heads the rankings in the hunt for the 2011 ASP World Title, but the perennial title contender remains cautious regarding the remainder of the season. The 2011 Billabong Pro J-Bay will make the history books for Smith’s second consecutive win and the phenomenal standard of surfing on the penultimate day when a perfect 10 point ride and a number of other high-flying and modernistic moves were performed and recorded in the planet’s premier high performance waves at Supertubes in Jeffreys Bay. The final day’s proceedings started with a moving tribute to the late Andy Irons, a former three-time ASP World Champion, the 2004 Billabong Pro J-Bay champion and long-time Billabong team rider who passed away earlier this year and would have celebrated his birthday today. All the action from the Billabong Pro J-Bay, including results, images and video-on-demand footage of every heat is available via www.billabongpro.com. Further information on the event can be found at the Facebook fan page Billabong South Africa or on twitter @BillabongSA. A daily 15 minute TV highlights package from the event will be broadcast on the channels of SuperSport with the premiere at 19h45 and multiple repeats. Check your TV schedule for updated broadcast times. The Billabong Pro J-Bay 2011 was proudly presented by South Africa’s adventure province Eastern Cape Parks and Tourism Agency and further supported by Carling Black Label, Monster Energy, Coca Cola, Amarok, Vida e Caffe, Tavcor, VonZipper and Nixon. Jordy Smith’s fairytale win at the Billabong Pro J-Bay in 2010 was the stuff of legends. It was the SA surfing sensation’s maiden ASP World Tour event victory, becoming the first South African since Shaun Tomson in the 1980’s to win such an event. He did it in his home surf, the win occurred on Nelson Mandela’s birthday – a day of huge significance to South Africa – a Jordy survived several clutch moments en route to the final thanks to his brilliant, confident, cutting edge surfing and his never-say-die competitive approach. Along the way he won the crowd, he won the event and he ended the day the No. 1 ranked surfer in the world. 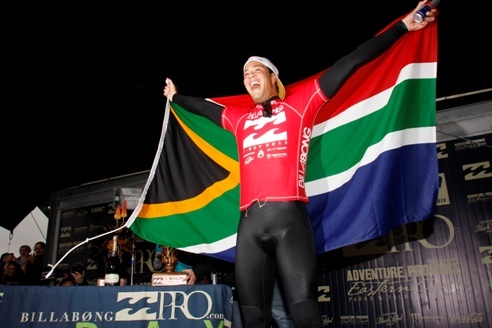 By the time the 2010 ASP Men’s Tour wrapped up in December Jordy was sitting pretty at number two in the world. Rated second to the one and only Kelly Slater. Later this week Jordy will paddle out to defend his Billabong Pro J-Bay crown and his legions of fans and admirers will be there – online and on the beach – to cheer him on. This, the fourth of six Webisodes to be released on www.billabongpro.com in the lead up to the event features Jordy’s take on his home event – what it felt like to win last year and why he feels totally at ease, arriving in J-Bay with the support of a nation behind him. The Billabong Pro J-Bay 2011 is scheduled for 14-24 July in the fabled waves of Supertubes in Jeffreys Bay. It is stop No. 4 of 11 on the ASP World Tour, the series of events that determines the annual ASP World Surfing Champion. The field comprises the world’s top 34 ranked professional surfers along with two wildcards. All the action will be webcast live via www.billabongpro.com. 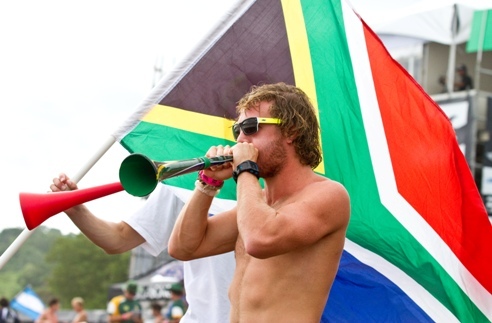 South Africa finished in seventh place out of the 27 nations at the 2011 Billabong ISA World Surfing Games in Panama which was completed in inconsistent one metre waves at Playa Venao, five hours drive west of Panama City on the Pacific coast of Panama yesterday (Saturday). The eight person team collected one medal, a copper for placing fourth in the Aloha Cup event. The two South Africans in contentions for medals going into the final day, Nikita Robb in the Women’s division and Matthew Moir in the Longboards, were both eliminated before reaching their respective finals. Robb was ousted in a wave starved Repecharge Round 7 heat where she placed fourth to finish equal eighth overall in the event, contributing 1 056 points to SA’s team total. Moir, a two-time former ISA World Longboard Champion (2006 & 2008) had cruised through the Qualifying stream but slipped to fourth place in Round 5, one step away from the Grand Final. Dropping into the Repecharge Final, where he had a second chance to qualify for the final four and a medal, Moir came agonisingly short of the top two result required to qualify for the Grand Final, placing third in the heat for overall 5th place in the event and a haul of 1 220 team points. These results combined with Argentina’s Santiago Muniz’s surprise victory in the Men’s division saw Team SA drop one place to seventh in the final rankings for the event. Team Australia clinched the team gold medal for the first time in three years, providing five of the 12 individual medallists who earned two silvers, two bronzes and a copper. Brazil grabbed the runners-up team silver medal with France taking bronze and Argentina the copper. Having contributed several of the highest individual wave and heat tallies during the seven-day event, Muniz was a worthy Men’s champion. Just 1.33 points separated first from fourth with Australia’s former ISA champion Mick Campbell taking the silver, 18 year-old South African born Thomas Woods (AUS) taking bronze and Ian Gouveia (BRA) the copper. France’s Canelle Bulard wrote her name into the ISA history books by becoming the first surfer to hold both the Junior and Open titles simultaneously when she won the Women’s division by defeating 2004 World and ISA champion Sofia Mulanovich (PER) and Australians Jessi Miley-Dyer and Dimity Stoyle, who finished in that order in the final. Tony Silvagni secured Team USA’s first Longboard gold in 15 years by overcoming the challenge of Harley Ingleby (AUS), Piccolo Clemente (PER) and Antoine Delpero (FRA). Panama’s President, Ricardo Martinelli, and Tourism Minister, Salomón Shamah, were guests of honour at the closing ceremony and medal presentation where Martinelli thanked everybody and invited the world to Panama to surf and enjoy its excellent waves.